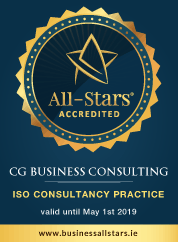 CG Business Consulting has helped accountants, solicitors, communication companies and many more professional service companies join the over 1.7 million companies around the globe that are ISO 9001 certified. Every organisation that implements the ISO standards has reported an increase in satisfied customers, better and more efficient ways of working, improved cost control and have also found the implementation of new work practices to be quicker and more effective. Qualified independent research has proven that they significantly outperform their competitors in terms of profit and return on investment. Some professional services organisations can also benefit from OHSAS 18001 Health & Safety Management or ISO 14001 Environmental Management.